Please join us for our 2nd Annual 5K/Mile Fun Run/Walk! This is a great way to get active! 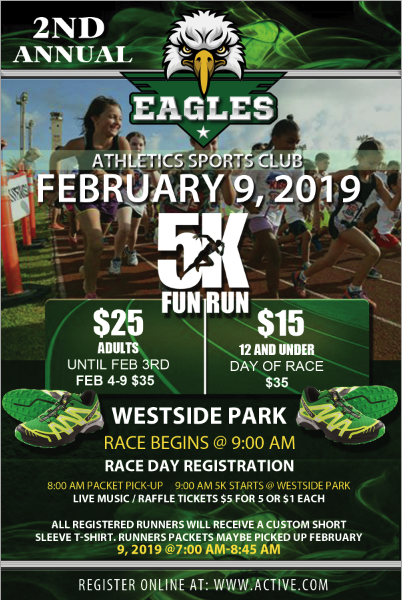 The Eagles Athletics Fun Run/Walk will take place in Gainmesville,Florida on Saturday, February 9, 2019. The event will start at 9:00 A.M. packet pick up will be from 7:00am - 8:45am. Please make sure you have on the proper running shoes, and comfortable clothing for this event. Please make sure all waivers are signed.